Nomex Gloves? What is Nomex? Sprint Cars, Stock Cars, Off Road, Drag Racing and Sports Cars. 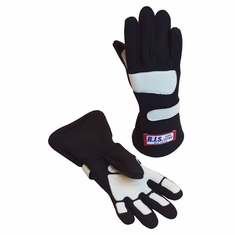 Drivers choose this regular driving glove made by RJS for its comfort. Constructed with calfskin palm over 1 layer of Nomex and comes with Velcro closure. SFI approved 3.3/1 Spec. The preferred glove for Indy and Formula Drivers. 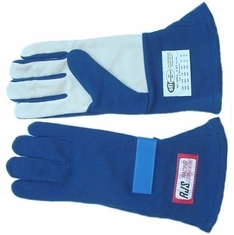 This glove made by RJS is also popular with Drag Racers; can also be used for Sprint Cars, Stock Cars, and Off Road Cars; constructed with calfskin palm over 2 layers of Nomex for a better grip on the wheel. Total Gauntlet, top and bottom. 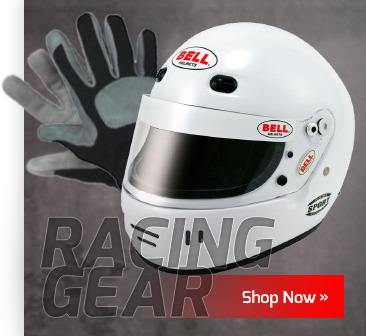 SFI approved 3.3/5 Spec ($2 less for XXS and XS & $5 more for XXL) Click so you don't miss our Drag Racing Gloves! 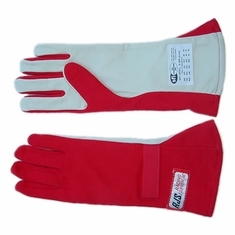 These are Made in USA SFI-20 Rated Racing Gloves constructed with calfskin palm over layers of Nomex for a better grip on the wheel and the ultimate in fire protection. Great for Drag Racing, Top Fuel, Top Alcohol, Nitro, Land Speed Record LSR competition (Bonneville Salt Flats, El Mirage etc.). Colors: Available in BLACK and RED. Comfortable and light weight double-layer Nomex® gloves. Feature pre-curved fingers with outside seams for dexterity and comfort. Palm & fingers fortified with racing performance leather grip points. Elastic at wrist for a more secure feeling while driving. SFI-3.3/5 approved. 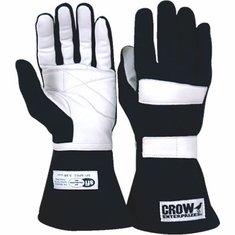 These Crow Nomex Gloves are SFI-5 approved. 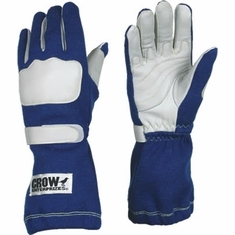 They are constructed of 2 layers of Nomex® and sewn with Nomex® thread and have extra padding on the palm and knuckles. Super comfortable auto racing gloves and with the peace of mind of SFI-3.3/5 approved fire resistant driving gloves at a very affordable price! 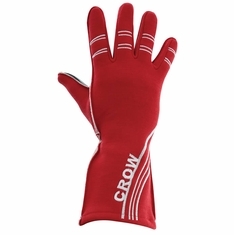 These Wings Nomex Gloves by Crow are long gauntlet driving gloves and are SFI-5 approved. 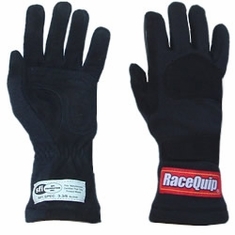 These auto racing gloves are constructed of 2 layers of Nomex® and sewn with Kevlar® thread and have extra padding on the palm and knuckle areas. Wear with the confidence of SFI-3.3/5 approved fire resistant driving gloves that are very comfortable and at a very affordable price! 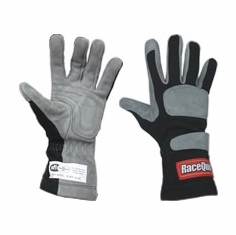 These Racequip auto racing gloves that are SFI-5 rated feature palm and knuckle pad reinforcements that attach to the Nomex® back so that it promotes flexibility. Also, extra leather has been added to the high-wear area between the index finger and thumb. Highest quality materials that are comfortable, soft and supple. Features a standard length gauntlet. 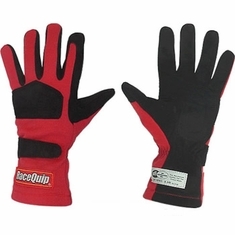 Racequip auto racing gloves Nomex® and leather single-layer gloves built to SFI-1 specs SFI 3.3/1 with a soft and supple feel. Gray suede leather palm creates a premium look and additional grip to this affordable SFI rated glove. Constructed with extra leather added between the index finger to the end of the thumb to reinforce the high-wear area. Top quality materials create soft, comfortable and supple racing gloves.